This weekend, Julie and I got to worship at Journey Church in Norman, OK with Pastor Clark Mitchell and his wife Robin. What a phenomenal church! The people are joyful and so welcoming. Their building is beautiful. The grounds are well kept. But, the thing that I walked away with was the depth and sincerity of their worship. Beautiful grounds, coffee and donuts, smiling people would never be able to hide hollow, going-through-the-motions worship. And, their's isn't. Kyle, their worship pastor leads an incredibly gifted and loyal praise team, and their service radiates out from the entire church. Julie and I were so blessed to be there with them Sunday morning (and Saturday night for dinner and Sunday for lunch--both of which were through the roof). Clark is one of those rare individuals who is a gifted, intuitive leader. Without even trying, he just gets it. But, then, he does try. And work. And pray. And study. He pays close attention to the details, but never takes his eyes off the big picture vision that God has given to him to lead Journey Church to fulfill. He's rare, because he voraciously adds to his intuitive gifts by reading and learning and seeking out other leaders to learn from. He's one of those people who just fill my tanks being around him. Having said that, as blessed and honored as we were to be their guests, we loved flying home tonight and that home means the good ol' ATX. As wonderful as Journey Church is, we were reminded how deeply and profoundly we love Lake Hills Church--the people, the worship, the vision that God lets us be a part of every day. This summer, if you're out of town on vacation somewhere, make it a point to go to church and worship somewhere that you've never been before. 2. Our capacity for worship is stretched. When you follow the worship leader of another congregation--and therefore that church's style of worship--you choose to do something that you're not as familiar with, so you have the opportunity to remember that worship isn't about OUR comfort. It's about OUR adoration of God. Lifting him up in a style or through songs we're not used to can actually help us re-center our worship on the One it's supposed to be all about anyway. 3. It's really healthy to ask the Holy Spirit to speak a fresh word into your life through a teacher/preacher that you're not used to. Maybe even in a denominational tradition that you're not used to. Again, same principles apply here as in the worship thing in #2. 4. New experiences always hold new lessons about God and about life. Through these new worship experiences, God will build and deepen your worship repertoire--and that's great. 5. Every time we do this as a family, no matter how powerful the presence of God, or inspiring the worship, how good the band, how popping the projectors, mind-blowing the technology (or lack thereof), or how anointed the preaching--we're excited to come home to LHC and the people and vision that God has called us to be a part of. So, this summer, on vacation...Go to church somewhere else! And, know that we look forward to seeing you back home. I was surrounded by incredibly passionate people. Passion--when it's well directed and properly channeled--is a powerful contagion. Everyone in that room this morning is passionate about their personal faith and relationship with Christ. Now, not everyone is always at mountaintop moment in our faith. We have periods of drought just like everyone. But, we get to partner with the Holy Spirit in seeing lives touched, redeemed, and impacted for eternity every day. But, they're not just passionate people. They are hungry for the Word of God and they go after it. They don't sit back and say, "Feed me! Feed me!" They take responsibility for feeding themselves and they serve other people and each other out of their spiritual diet. There is no religious flab on any of them. Also, every person on our staff carries a burning torch for people who don't yet know how extravagantly God loves them. You can hear it in their voices and see it in their eyes when they talk about friends they have who aren't Christ-followers or when we talk about opening our downtown campus this fall; there's an urgency and a concern that flows out of Christ's heart. And, maybe most infectious of all, they are joyful. For every one of them, ministry isn't a burden; it's a blessing. It's a gift to get to do what we get to do every day. Sure, we have bad days and meetings that don't go the way we want them to with people who are hurting or hurtful. But, all in all, serving Christ and serving and leading his church is a joy and a privilege that we wouldn't trade for anything else. With less than 24 hours left in Road Trip '08, I can tell you that God has shown up huge-time. Besides the scenery (see right) and the temperature (it got all the way up to 74 degrees today! ), we've gotten to see kids and sponsors' lives touched by God in powerful ways. In addition to those things, it's been a week of incredible fun: Mountain biking--literally--rock climbing, wallyball (volleyball played on a racquetball court), white-water rafting, and swimming, no one has been bored or at a loss for activities. Pray for our last worship service tonight, tomorrow's baptism, and safety as everyone begins heading home to Texas tomorrow. Summer didn't just start for LHC and our family. It launched. First, One Prayer is off and running. I'm so grateful to Craig Groeschel for the whole One Prayer initiative and his leadership in this effort. And, for his message last week. And, of course, Ed Young just flat brought it this weekend. If only Ed were a little more passionate! 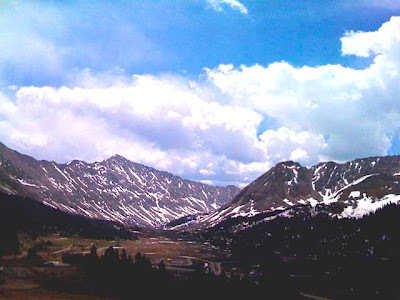 This week, I'm with the LHC high school students for Road Trip 2008 in Copper Mountain, CO, while Julie and the kids are spending time with her sisters and their kids at the beach. Now, I love living in Austin, being a Texan and all that goes with that. But, I gotta tell you, it isn't all bad waking up to 38 degrees and needing a long sleeve shirt. Yesterday, the high temp. was 71. Last night was our first service of the week. Having just disembarked from a 24-hour bus ride (made longer by a 3-hour mechanical problem in Amarillo), the students were whipped tired, but they were great and God is definitely moving. Be praying for this time that God will use this week in a powerful way in each of our lives. And, to everyone who has prayed, worked, and given financially so this week could happen: THANK YOU FOR BEING THAT KIND OF CHURCH! This weekend, we're going to hear from the leader of the One Prayer movement, Craig Groeschel. Craig is the pastor of LifeChurch, which is based in Edmond, OK and has locations across the nation. Craig is one of those people who just get it. But, beyond that fact, he is anointed by God with an amazing capacity for vision, leadership, and integrity. He really may be the poster child for Jesus' charge for his followers: "be as shrewd as snakes and as innocent as doves." As you might have guessed, Craig's sermon is entitled, "God, Make Us One." I've already seen it, and it is so encouraging and challenging--I'm grateful that what God gave to Craig is going to be a part of the LHC fabric going forward. For just a taste of how far the reach of One Prayer has spread, go to the One Prayer website and join the conversation. "I wasn't sure about watching the sermon, but it was great. Once it started, I was into it and forgot that it was video." "I realized that unless I'm in the first couple of rows, I watch the screens anyway." "It looked like Mac's eyes were two black holes--I couldn't see him." "It was little distracting when he looked off to the sides and wasn't looking in the camera." "I was surprised, but that works." "I had been hesitant about being a part of LHC Downtown in the fall, but now that I've seen it, I'm in." 1. Video works. The idea of a sermon on video is tougher to describe and accept than it is to actually experience. 2. We need to improve our lighting so that the image is consistent, specifically uplighting. 3. The image that we used Sunday was produced at 24 frames/second, which is closer to how film appears, vs. video which is 30 f/sec. 24 f/sec. gives you a cool texture and is more artistic if you're shooting say a music video or a creative element to use in the service. But, for the purposes of delivering a sermon, we need to use 30 f/sec. It gives a more immediate, clearer HD picture. Both are shot and projected in HD, but you lose a lot of that at 24 f/sec. 4. The audio quality was OK--and OK is not our standard. It's going to be a kick in the pants to see how God uses this in and through LHC in the months and years to come. If you're an LHC member, thanks for being a part of it and praying for your church (and pastor). If you're not, thank you for praying for us and the people that God is going to reach through us. That's the number that drives me early this morning. That's the number that will fuel our staff meeting in an hour and a half. That's the number that reminds us why we do what we do. It's encouragement, affirmation, perseverance, and everything needed to keep going when you get tired, bruised, or just feel like coasting. 7. That's how many people stepped over the line of faith this past week in LHC worship services. 7 more people doing life this morning in relationship with God. 7 more people more aware of who they were created to be. 7 more people who will experience eternity in perfect, open relationship with Christ. 7 more people who are glad that LHC goes hard at ministry through the summer rather than easing up and just hanging on for fall and back to school. 7 more people who know that someone loved them enough to invite them and share with them the extravagant love of God. 7 more people who can now share that same love with others in their particular spheres of influence. 7 more people who are grateful that LHC brings God's tithe to fuel ministries that affect people's lives. In Church World, you don't get any older than Communion. Jesus instituted this tradition even before the Church Age technically began. But, even 2000 years later, what a powerful reminder it was yesterday of his extravagant love and call to holiness in our lives. I loved celebrating Communion on the heels of the great hymn "Jesus Paid It All" which followed some killer new classics of worship. It was a unique platform for the introduction of video preaching to our church. I have to admit that I was initially skeptical a few years ago when I began hearing the subterranean rumblings of other churches applying this technology to ministry. But, I am absolutely convinced that it can be very effective when coupled with real, hands-on, boots-on-the-ground ministry and leadership. I know that for some it is a leap too far, but when done right and well, God is using and blessing this strategy to multiply Kingdom resources and work. I love that we get to be a part of that together.